A proposal for a new 38-story hotel in downtown Denver is set to be considered by the city’s Landmark Preservation Commission next week. The structure, which is referred to as Block 162 Hotel in the application to the commission, would be built midblock along California and Welton streets, between 15th and 16th streets. 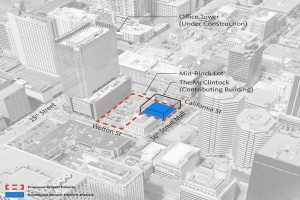 It would be next to Houston-based Patrinely Group’s planned 30-story Block 162 office tower, which broke ground this year. The block also includes two structures along 16th Street, the McClintock and Sage buildings. While the Sage building is not part of the proposal, the three-story McClintock building, at 620 16th St., would be renovated in connection with the project, becoming “the primary pedestrian entrance and an important amenity hub for the hotel,” according to the application. The project is going before the Landmark Preservation Commission because the McClintock building, which dates to 1910, is involved. 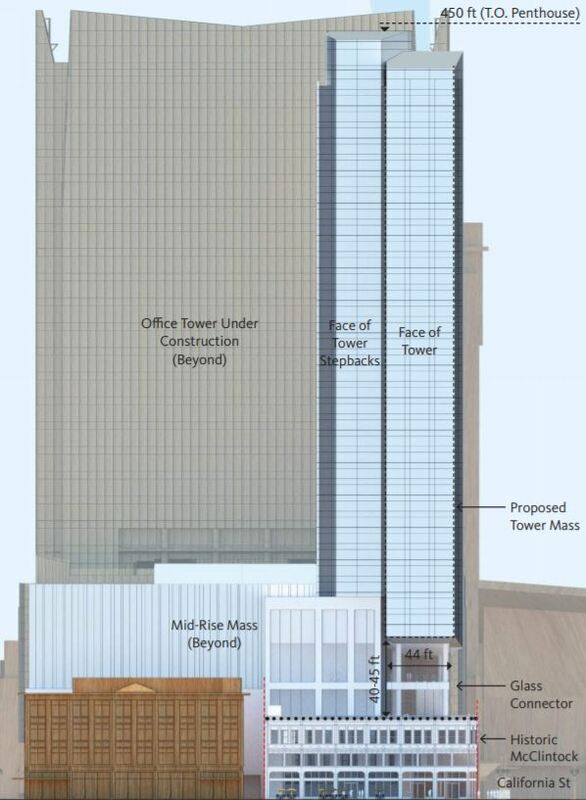 The proposed hotel building, meanwhile, would consist of a nine-story podium level, with a slim tower protruding upwards on the California Street side for an additional 29 floors, according to the plans. The hotel would have ballroom or meeting space on the third through eighth floors, with a rooftop bar, and a pool and outdoor deck on the ninth level, at the top of the podium. 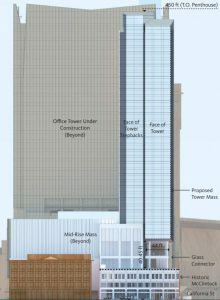 Hotel rooms would begin on the sixth floor, and continue upward into the tower, according to the plans, which indicate there would be about 450 rooms and suites in all. The hotel would have three levels of below-grade parking with 169 spots. Gensler and Anderson Hallas Architects drew up the project plans. Patrinely is developing the Block 162 office tower on land assembled by Evan Makovsky, with whom the company struck a 99-year ground lease. When the office tower was first proposed in early 2016, Patrinely also spoke of plans for a hotel at the site. 1 Comment on "38-story hotel proposed for land next to under-construction downtown office tower"
Having the hotel parking exit cross the light rail tracks right next to pedestrian-heavy station area is questionable on a number of fronts.